Ah, the joys of watching a sub-par sequel. Before we let ourselves put the cart ahead of the horse - or in this case a tiger - we'll first look at the plot. 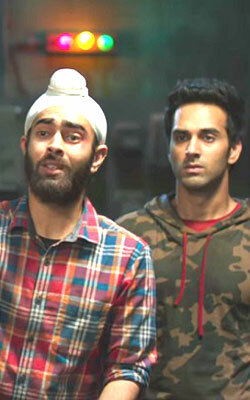 It is a year since the events of the first film, and the trio of Hunny (Pulkit Samrat), Choocha (Varun Sharma) and Lulli (Manjot Singh) are busy with their jugaads. Zafar (Ali Fazal) is also busy trying to lead the life of a normal man by moving in with his girlfriend Neetu (Vishakha Singh). Unknown to them, lady don Bholi Punjaban (Richa Chadda) makes a deal with politician Babulal Bhatia (Rajiv Gupta) that gets her out of her prison cell. The deal includes a 10 crore fee, and Bholi enlists the four-kreys to come up with one of their patented get-rich-quick schemes in order to raise the money. This simple plot line is soon convoluted with enough lottery frauds, tigers, Choocha's premonitions, hidden treasures and other pointless sub-plots to take it totally beyond the capability of the filmmakers to execute. The original Fukrey was the poor man's Delhi Belly. While the former took its inspiration from the latter and used it to its benefit, it should have stuck to Delhi Belly's one-and-done principle, too. The fact of the matter is, like Tashi, Arup and Nitin before them, Hunny, Choocha, Zafar and Lulli are fun when they are lazy and naïve youths. But they can stay inept in one story and one story alone. When they learn no lessons from their harrowing adventures, and choose to remain man-children, the movie runs into what is called The Hangover Effect - an unforgiving disease that affects innocent sequels. This disease leaves films gasping from needless sub-plots with every breath. It makes these sequels bloated beyond what the silver screen can hold. This illness is so intolerant that it makes characters and actors we previously liked mostly unbearable on their return. It is a sickness that claims sequels by the dozens every year by infecting them with the viruses of bad comedy, rehashed scenes and languid pacing with an unrelenting smugness about it all. Please contact your local director and ask them to vaccinate their next sequel idea with this antibiotic simply known as - Screenplay. It is free of charge, and as we all know, prevention is better than a cure. While the film is critically infected with this ailment, the actors come out of mostly unscathed. Pulkit Samrat, Ali Fazal, Manjot Singh, Richa Chadda and the apogee of acting simply known as Pankaj Tripathi are all endlessly watchable even though the titular boys themselves have little distinguishing their characters. Varun Sharma's Choocha, however, is not so lucky. He is clearly the Zack Galifianakis of the group, and his antics begin to grate on you as the film goes on. Jokes about his not bathing or his unexplained premonitions are bound to wear on your patience when they come packaged as part of an underwhelming film. The movie's visual and sound departments do their best to distract the audience from this hoarse performance. While the songs are nothing to write home about, the score is as apt as can be. Even though the musical aesthetic is a pale imitation of Ram Sampath's original work, it serves the purpose and then some when push comes to shove. Making up for some blatantly juvenile word-based humour is the film's electric editing. As the spoken words land with a sickening thud, the smooth cuts between characters whose expressions build off each other find those jagged gems of comedy in the murky landscape of this film. At a juncture in the film, Zafar makes a poignant observation. He says, "If everything is coming your way, you are probably in the wrong lane." I agree with and second that sentiment. What saddens me, however, is that the characters themselves are unaware that they are the ones driving in said wrong lane. All the aforementioned problems with their story come hurtling their way with no respite in sight, but the characters take on all comers with a gleeful and green smile. If it weren't for that, you would completely hate the ride you took with them instead of just moderately disliking it, as you are more likely to do. Be the first to comment on Fukrey Returns! Just use the simple form below. fullhyd.com has 700,000+ monthly visits. Tell Hyderabad what you feel about Fukrey Returns!